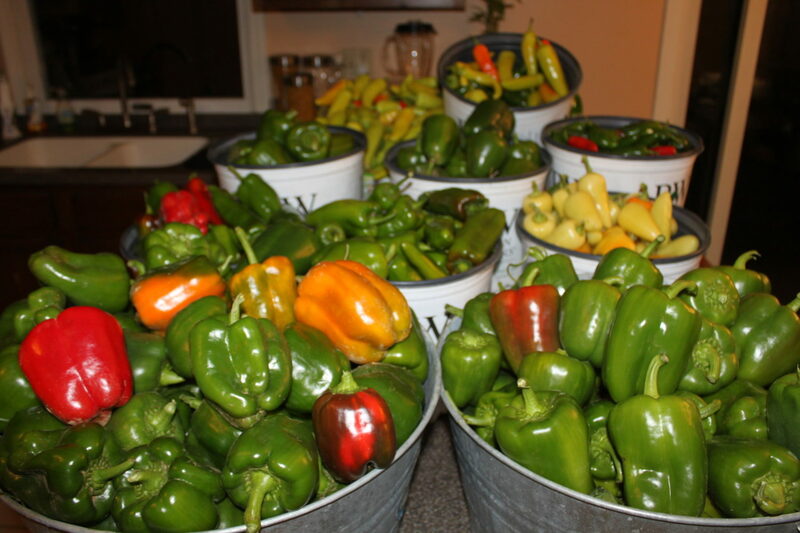 As the summer garden season progresses into late August each year, we always find ourselves searching for ways to preserve the hundreds of peppers that seem to ripen all at once. A few years back, we began to use the excess of peppers to create our own hot pepper flakes, ground pepper powder and even our own chili powder. Late summer always brings an overload of peppers from the garden! The taste is so fresh – with no worries of preservatives or additives that are found in so many of the commercial spices and spice packets! You can dry nearly any variety of your hot or mild peppers to make your own unique blends, and in fact, many times we create a great tasting powder from drying and grinding a mix of our Cayenne, Cajun Belle and Chinese 5 color peppers all at once. 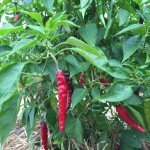 But with a bounty of cayenne peppers ripening all at once in the garden – we thought for today’s article and corresponding video, we would share how we make our cayenne powder. You can see step by step instructions below along with a printable recipe. The process is easy to complete and can be done in a number of ways. We use simple oven method below for today’s recipe – but you can also use a dehydrator if you have one on hand, or you can dry your peppers slowly in the sun if you live in a hot and arid climate. Our humidity levels here in Ohio can make that difficult – so we usually go with the oven or dehydrator method. Once the peppers are dried, the process is the same to make the powder no matter the method used for drying. Wearing gloves (do NOT skip this part!! ), wash and dry the peppers. Place the peppers in the oven and bake until dried. The amount of time will vary depending on the pepper size and thickness. You can remove the peppers that have dried and keep the others in the oven until they are all done. Our most recent batch took 6 hours to complete. Once the peppers have cooled, place them in the food processor/grinder and pulse until at the desired powder consistency. Sift through a fine mesh strainer to remove the seeds. *You can eliminate this step if you cut the seeds out of each pepper, however we have found it to be much quicker using this method. **Tip — This is best done in a well-ventilated kitchen. Also, when opening the oven door, allow the air to escape before looking in – otherwise you will get a hot pepper steam facial! Store in an air tight container for up to 6 months for maximum freshness – or you can freeze them as well to keep even longer. Place the peppers in the oven and bake until dried. The amount of time will vary depending on the pepper size and thickness. You can remove the peppers that haved dried and keep the others in the oven until they are all done. Our most recent batch took 6 hours to complete. **Tip -- This is best done in a well venilated kitchen. Also, when opening the oven door, allow the air to escape before looking in - otherwise you will get a hot pepper steam facial! ← Making Open Kettle Garden Chili Over The Fire – A great night at the Farm!